This is literally everything I believe you need to know about dining in Walt Disney World, all the other Disney parks, and the Disney Cruise Line. Whether if you’re looking for info about dining with special diets, making advanced reservations, restaurant dress code and etiquette, restaurant menus and reviews, or Disney dining discounts, this is the right place for you! Just be sure to check back regularly because new info will be added often. So with that being said, let’s jump straight into it! Need to know if Ohana is truly worth the hype? Is Be Our Guest really worth reserving 180 days in advance? Should you really cough up $70 a person at the Royal Table? Find out the truth as well as info on all other Disney restaurants in our restaurant review section. This truly is a must-read! Here’s the complete listing of menus for all the restaurants and eateries in Walt Disney World. Here’s a short and sweet, yet super informative guide to help you make advance dining reservations, as well as score those ridiculously hard to get dining reservations as well. Find out everything there is to know about dining in Walt Disney World. Whether if you’re venturing to a signature dining restaurant or just trying to meet Cinderella at Royal Table, my dining dress code guide will get you ready. Do you have special dietary restrictions or concerns? Are you allergic to gluten, dairy, wheat, nuts, soy, etc, but still want to be able to enjoy magical meals? If so, be sure to check out our special diets resource page. Thinking about getting the Disney Dining plan for your next trip? If so, you must read our dining plan guide. Not only will you be able to learn how to maximize the Disney dining plan, you’ll also find cool tricks, tips, and secrets that will help you have the best meals possible. Did you know that you can actually get discounts at almost all restaurants and eating establishments? The resources below will show you how. 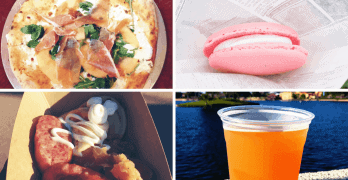 Here’a one of our all time favorite resources that you absolutely must check out if you’re looking for the best restaurants and tastiest eats on Disney World property. Still need some more dining and restaurant information, please feel free send me an email, or better, send me a tweet @MrAdamBryan with your question or request.